Planning a party for kids can be a lot of things. Fun, exciting and exhausting are just a few things that come to mind. However, if you have any kind of a special event coming up for your kids, it’s important to not skip out on the details, like a great theme. Setting the right theme for the party will go a long way toward having success, and here are some great children’s party ideas you should consider. Themes from the movies are almost always a good answer when you’re looking for children’s party ideas. Some of the more popular movies over the last several years include The Hunger Games and Harry Potter. Of course any kind of a theme that relates to super heroes is likely to be wildly popular, and there are some great ambient tracks inspired by super heroes movies that would be a great compliment to your party. The only thing most kids like better that super heroes are video games. You could make some great decorations to go along with a video game theme and the kids would love it. Depending on the age of the kids, they might even think it was cool to go “old school” on the games. At the top of the list of children’s party ideas are cartoons, although you have to be careful about the age of the kids. Make sure to make the cartoons age-appropriate for the kids. You’re not likely to have much success if you’re hosting a party for 12 year olds and the theme is Barney. Pick the cartoons to focus on that are popular for the age group of children you will be hosting. Anything about pirates is another item on the list of popular children’s party ideas. You can focus on the good pirates or the bad ones and may even make your pirate theme focused on Dr Hook from Peter Pan. Halloween is always one of the best ideas for kids birthday parties if the party is anywhere near the end of October. If you do that, it’s nearly mandatory to have some great scary music as part of your theme. 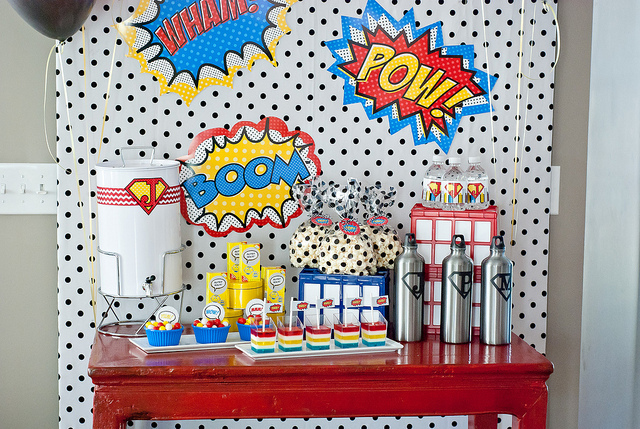 You can also focus your children’s party ideas on topics that are especially interesting to your child. If they are really interested in space or astrology, the ocean, the forest, etc they would get a huge kick out of a themed party that is just for them. When looking at children’s party ideas, it’s obviously important to make it fun so they will enjoy the party. However, when you’re looking for background music for the party, don’t forget about the end. One of the recent trends in sport stadiums is to play music that is a little more mellow at the end. After the game is over, and everyone has had ample time to celebrate the win, more and more venues are choosing to blast music that is still fun, but is much more mellow. This helps people to start calming down before they head out the (likely) crammed parking lot. The same concept applies to children’s party ideas. It will be worth it to take a few minutes and find some great ambient music that is relaxing to play. This can be used at the end of a regular day party, and comes in especially handy during slumber parties.